The LED industry can be a peaceful or burning world. It can be a place where you introduce your beloved so they can become rich, or be turned into a torture device to be used against your worst enemy. Happiness tightly related to bitter misery can be found in the industry throughout 2014. Some manufacturers have been successful at the end of 2014, while others have sadly left the market. 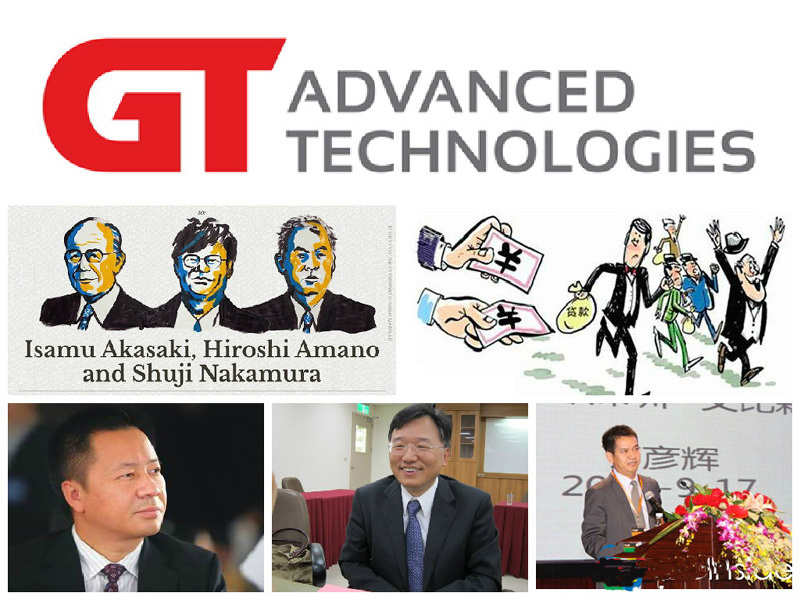 Top: GTAT logo, Center left: Isamu Akasaki, Hiroshi Amano and Shuji Nakamura, Bottom left to right: Former NVC Lighting CEO and Chairman Wu Changjiang, Epistar Chairman B.J. Lee and Absen Chairman Yanhui Ding. Most industry experts would agree, the most important event in 2014 was three Japanese blue LED inventors winning the Nobel Prize for Physics award. On Oct. 8, 2014, Japanese scientists Isamu Akasaki, Hiroshi Amano and Shuji Nakamura shared the Nobel Prize for Physics for their invention of the blue LED. Nakamura said "anger" was the driving force behind his success. While working with Nichia in the 1990s, he was often criticized by superiors because the LED products he developed were not selling. His superior even often questioned him "How come you haven’t resigned yet?" Nakamura still holds a dissatisfaction against this and once argued: "Anger has been the driving force, without it I would have never succeeded." After decades of hard labor, Chinese LED manufacturer Absen, has finally become a listed company on the Chinese exchanges. July 24, 2014 marks the special date when Absen first publically issued 15.47 million shares at RMB 18.43 (US $ 2.95) per share. Absen founder and chairman Yanhui Ding has come a long way, having started out as a reporter, he went on to become a stock trader, and even sales before settling down in the LED industry in Shenzhen, Guangdong Province, China. Having been in the LED industry for more than 17 years, he had less than RMB 500 capital in the beginning. Despite all the hardships and complicated feelings he has for the LED industry, "I’ve never thought about giving up," said Mr. Ding. Absen is finally able to compete on the capital market after becoming listed on the market. The company strong performance has also met investors expectations. The company reported net profits reached between RMB 151 million to RMB 162 million, and reported annual growth would range was 32% to 42% in 2014. Mr. Ding has even set his 2015 revenue target at RMB 2 billion. Epistar history has been a record of mergers. In late June 2014, Epistar continued its acquisition strategy by absorbing FOREPI into its growing empire. Epistar has merged six major Taiwanese LED manufacturers including United Epitaxy, South Epitaxy, Epitech, Highlink Technology, Huga Optotech, FOREPI, and TSMC SSL. The humble Epistar Chairman B.J. Lee seems to be very accustomed to mergers. Former NVC Lighting Chairman Changjiang Wu has earned the title "the lost one." for sure. The founder of NVC Lighting had tried to establish his brand only to give it away to current company Chairman Wang Donglei. Even Wu former distribution allies are unable to save him. Besides, Wu has been held in custody over accusations of misappropriating company funds. He has definitely gone through ups and downs. A person should avoid making the same mistakes twice, but unfortunately Wu made the same slip in 2014. This time the impact was even more traffic. Phoenix motto was once " leader in LED applications and branding", but the company ironically became the first "runaway" company in 2014. The company spent a fortune on celebrity endorsements, but forgot the most important feature for LEDs is "product quality." Finally, the company founder had o make a run for it. It was not just the company founder that suffered, many suppliers and distributors were also affected by delayed accounts receivable. Phoenix is no longer a "legend" and Juliang is no longer the bright torch it once was. Companies were walking dangerously since the bankruptcies, who knows what lingering butterfly effects this new wave of insolvency will create, and how many more suppliers will be affected by bad debts. Today is very cruel, but tomorrow will be even more brutal. The day after might be beautiful, but many manufacturers will not survive to see the sun. Manufacturers need to be fully prepared if they want to make it to the "day after". Steve Job’s "Apple" turned out to be difficult to swallow. The missing sapphire screens in the newly iPhone 6 sealed GTAT doomed fate. The U.S. manufacturer applied for bankruptcy protection on Oct. 6, 2014, and the company took less than a month to arrive to a settlement with Apple. In contrast, how much time and money was invested into constructing the sapphire factories in Arizona? Apple announced on Feb. 2, 2015, it will be investing US $2 billion to turn the failed GTAT sapphire factory in Arizona into a data center. Perhaps only GTAT will know what it feels like to witness a sapphire factory being rebuilt into a data center.